“I’m trapped! !” the classic comment from family, friends, and guests when they dine at our home…talk about embarrassing! But it was the truth. Our dining room was a hot mess! A hot mess that always had us playing a form of dining room twister in order to pass food, water, etc. around the table. And God forbid a child or elderly should need assistance on the other side of the table…the most efficient way to get to them would be to literally climb over the table. And etiquette tells me this is highly frowned upon table manners…but what’s a host to do? It all started 9 years ago when we moved into our home. We were moving from a town house. The town house had a very large master bedroom that comfortably allowed for a king size sleigh bed, chest, nightstand, and long gorgeous dresser with framed mirror. It was beautiful! Problem was we were now moving into a home that was built in the 1940s and apparently people back then were clearly not the consumers that we are today! The closet space was minimal, the bed barely fit, and we managed to squeeze the chest and nightstand, but there was no way my gorgeous dresser would ever fit. So guess where it went? The dining room! The dresser surprisingly looked nice in the space, like a beautiful buffet and it gave the dining room a more formal touch. So I decided to add to the formality of the space and transform a book shelf into a hutch…well almost entirely, I never added doors to the bottom. But I did add a place to hang wine glasses and added all our formal dining dishes to the shelves. It worked, in fact the two pieces of furniture coordinated nicely. The problem only began once we actually used the space. See, in addition to the dresser and book shelf there was also the dining room table, chairs, and bench…now that’s a lot for a 1940s sized dining room. The first few times we entertained in the space I just thought of it as cozy. Mind you we only had a child and perhaps an additional couple or two dining with us. Fast forward to today and we have three children and our gatherings often include a minimal of 8 additional people. Thus that cozy quaint space went straight to crowded and guest claiming “I’m trapped!” It got to the point that when we would host Thanksgiving and Easter for our extended families my husband and I would literally move all the living room furniture into the dining room and dining room into the living room so that our guest could comfortable breath move. To be entirely honest there were a few months…going on years… where the dining room was simply that room where we would walk through on our way to the kitchen and store an occasional item on the table (note the ironing board and bags in the image above…and yes, ceramic Easter items still on the shelf long after Easter, ha-ha). Then I had an epiphany! What if…now what I am about to say might blow your mind so you might want to sit down if you aren’t already…we get rid of some furniture. Crazy right!? I finally came to terms with the fact that while having (semi) formal dining room furniture was appealing it simply wasn’t practical for our space or our life. I had to let go of the dream of having all the furniture in order to reclaim the space. So I removed the hutch from the dining room and managed to find a new home for the dishes…funny thing is, we have yet to even use half of those fancy dishes…(for some reason shrimp cocktail, fancy cheese, and whatever else you are supposed to serve in the crystal aren’t a regular when we entertain families with young kiddos, lol!) 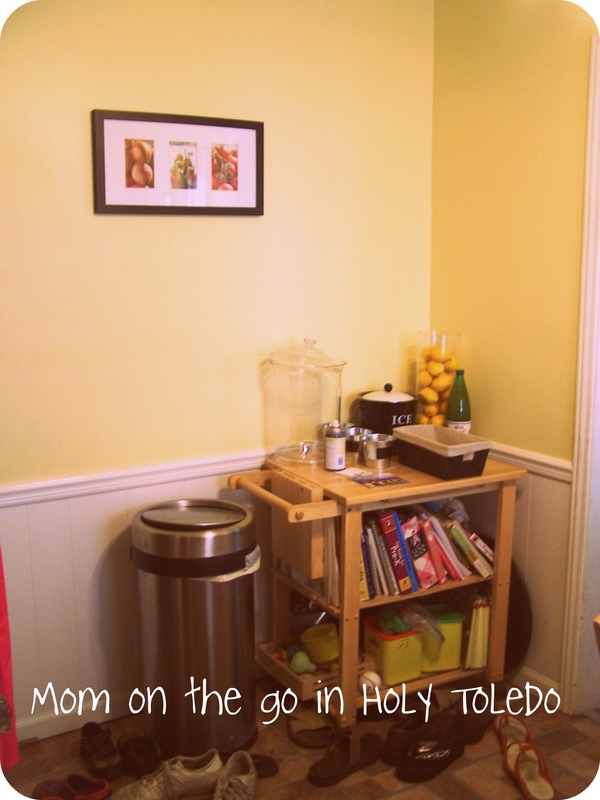 I found a new location for the hutch in the kitchen. We had a space that wasn’t being utilized to its full potential. The furniture piece that was there was too deep for the space, and was basically the catch-all for random items so it was bursting with stuff. And the wall space above wasn’t even being utilized. Oh, and do you see all the shoes? This area was screaming reorganize me! And I did! What was once a mere display unit where guest could see all our pretty dishes that never got used is now a practical piece of furniture that stores my cookbooks, children’s homeschooling workbooks, play dough fun, shoes, keys, glasses, sports equipment, and more! And guess what? We can now comfortably sit around the dining room table. Fancy that! I repurposed one piece of furniture and what we received in return was a way to repurpose our life that involves more structure and we can entertain in the dining room again! So what do you think? 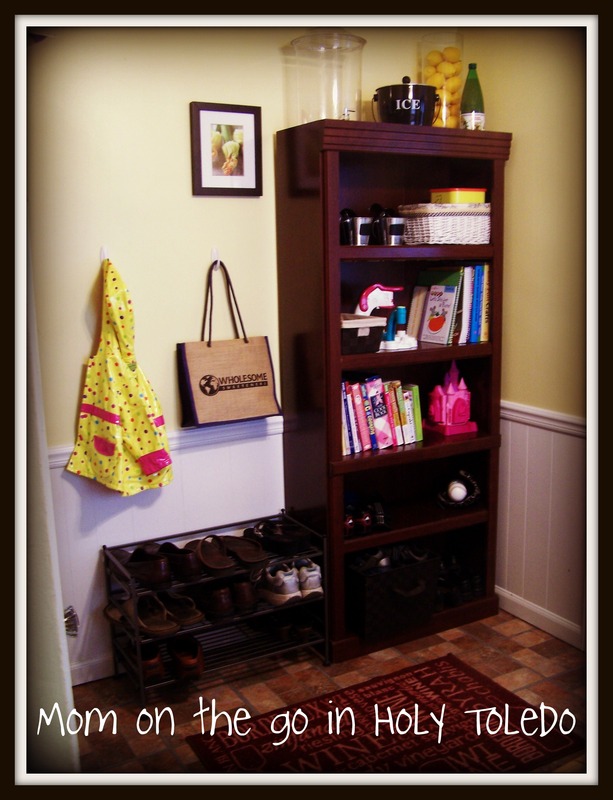 Do you have a space in your home that is cramped? 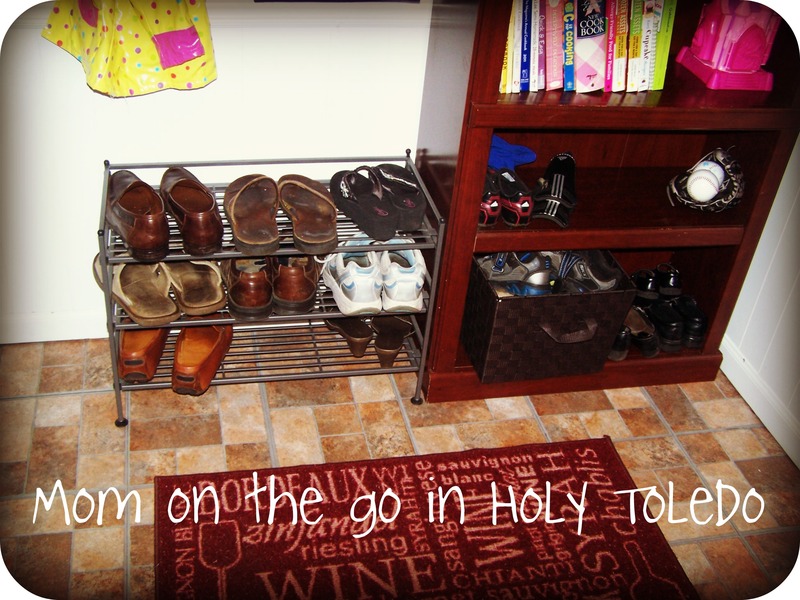 Have you ever had to move furniture around in order to accommodate your guests? 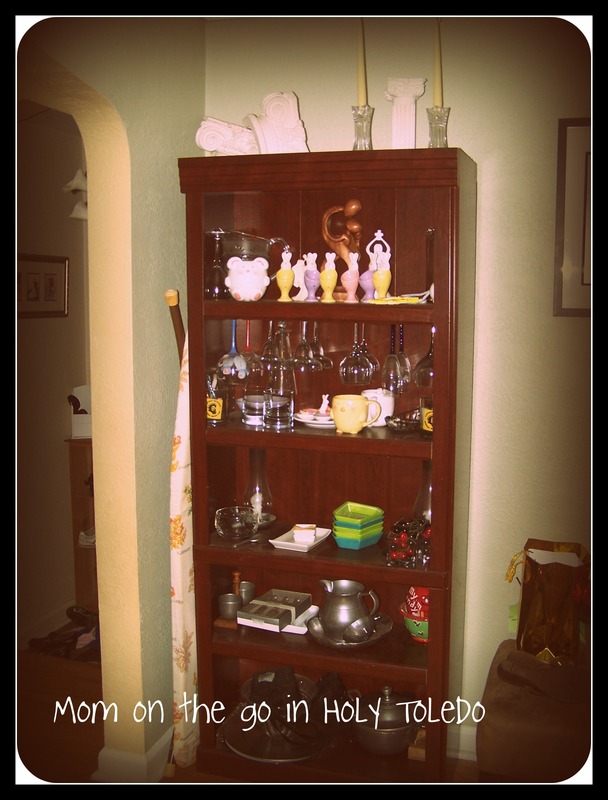 Do you display dishes in a hutch? Do you ever use those dishes? Or are you like me and you never touch them except when you have to dust, lol? Like the featured image with the clawfoot tub as a couch? 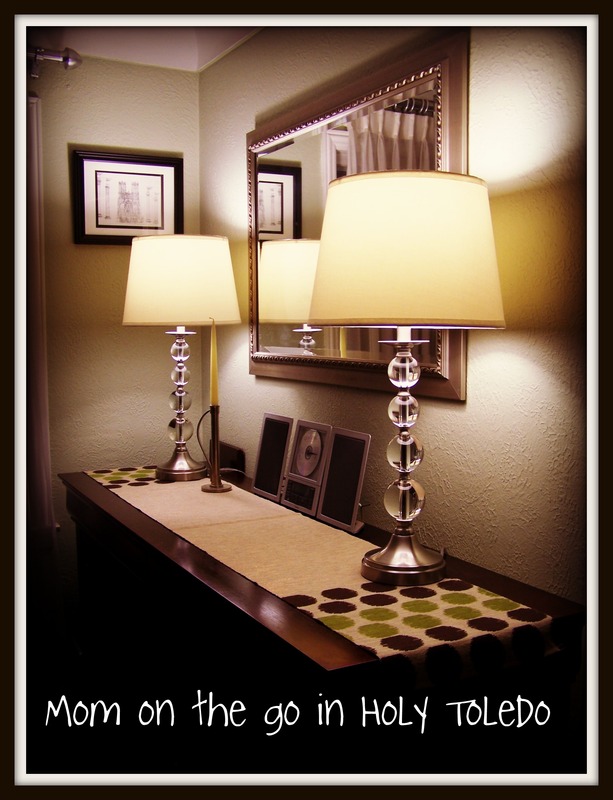 Then click here for some more fun creative ways to repurpose furniture. I have to say Kat, it looks great! Much more functional for your family’s needs. I think furniture design and functionality is stuck between what made sense in the past and what people need today. I think the formal dining room will probably be a thing of the past, judging from the creative ways people are using that space in their homes these days. I use mine once a year for Thanksgiving and thats it! I would love a hutch or a buffet, I have a curio and it is not enough space to store everything. Do I really need to display every “nice” dish I own? Probably not…so where did you move the cart in the kitchen? So true Alison! My questions is, since entertaining has changed so much why do we still have young engaged couples registering for all these items they will never use? Should we let them in on the secret that most of those items will get used once a year, if at all…and all they will do is take up space where something more functional could reside? Truth be told I probably should have just gotten rid of all those fancy crystals, sterling silver serving set, etc. but I think I might have some weird attachment, lol! So I managed to cram them into the kitchen cupboards. Next project, kitchen cupboards, haha! Found you through That DIY Party. Your place looks great! I have to say, one side of my dining table is totally useless because of the seating issue back there…. That’s something I’m going to have to address!